I couldn't sit continuously any longer, the kilometres had taken their toll. The Fizik Arione R5 saddle I recently bought to replace the rather bad saddle that originally came with my roadbike couldn't help this. From now on I had to switch between seated and standing position on the bike. It couldn't be helped. Just a bit longer, just a bit, you're almost there, to the next intersection, around the next corner, over the next bridge, just follow the wheel in front of you, not to close, don't fall behind. "Just three more bridges to cross". Earlier that day I had just awoken at half past 4 (yes that's 04:30 or 4.30 am). I managed to eat a good amount of oatmeal with some brown sugar I had prepared with water. Always a good basis for an intense day on the bike as you digest it slowly. I had already packed everything I would be needing the day before. So I had plenty of time to make the 06:02 train to Amsterdam Central Station. Normally I would take a train from Rotterdam Blaak Station but around this time of day that wasn't an option. So after I showered and got my heartrate strap, undershirt, jersey, bibshort, shoes and other cycling gear on I set out to Rotterdam Central Station by bike instead. There I met the first of many new faces I would be meeting that day. Online forums are fun and you get to know people a bit but actually meeting them is always a bit strange. Pirmin, probably the youngest of us with his 20 years, was the first of that day. During the train ride we spoke about things cyclists speak about. Bikes, fuel for the day, weather, cadence, Garmin and their somewhat lacking programming skills regarding the firmware of their pricy products. After arriving in Amsterdam we took the ferry from Central to Buiksloterweg as Stephan had indicated. Stephan, the only guy I actually cycled with several times before this day, had indicated that it was just a short ride from there to the meetup point. And indeed it was, although we almost cycled right past the group that was already there due to following the exact instructions my Edge 810 was giving us. The group was almost complete with Stephan, Martijn, Bart, Roy, Vincent, Pirmin and me. It was slightly before 08:00 so we were right on schedule. Juul however had indicate that he would be 5 minutes late. We agreed we would wait no later then 08:10 which gave us time to shake hands and match the nicknames of the forum with the actual names. Vincent had enough time to fix his saddle with my multitool just before Juul arrived. Time to hit the road with the eight of us. Eager as we were we started cycling at a pace which would eventually be too much for some. Like everybody knows or I hope they do, you should never start too fast. It's always better to pick up the pace if you need to then overexert yourself at the start. However the first 100 kilometres we did averaged about 34,5 km/h and peaked at 40 km/h while riding alongside of the IJmeer. During this first 100 K we were lucky enough to jump into the wheel of some other guys that were doing a tour (Ronde van de Westfriese Omringdijk) as predicted by Martijn, even though it was only for a 10 to 15 K it did slow us down so other could catch up again and also shielded us from the wind in this section. Roughly here Vincent had to stop due to a injury he sustained a while ago. We were down to seven. Around Medemblik we had our first pitstop to refill our waterbottles. We agreed to keep the pace to about 33 km/h and to rotate more. However some of us were not that familiar with riding in a bunch and due to having to catch up some of the time due to falling behind while having difficulty staying in the wheel of the guy in front of them they had to eventually drop entirely and decided to go to Den Helder instead of crossing the Afsluitdijk. Down to five. Stephan, Martijn, Pirmin, Juul and I started the long and boring ride over the Afsluitdijk. A 32 kilometre long barrier that the Dutch created not so long ago (completed in 1932) and with it the largest lake in western Europe. Wind did effect us here but it could have been so much worse. After the Afsluitdijk Pirmin was almost driven from his bike by some idiotic driver that would not give us any room on the road. Even though he did fall over on the side of a dyke, he didn't suffer any damage as he just missed the barbwire and his bike was fine after I reset his shifter at the right angle. We carried on and reached Makkum, our first real food stop of the day. Here we got Tomato soup and omelette filled with vegetables and ham while getting some needed sugars from cola. Since crossing the Afsluitdijk the weather had changed from grey to very sunny and some had not applied any sunscreen. We soon refilled our bottles again and headed south. The kilometres were adding up now, the legs were starting to get soar here just shy of our halfway mark (185 K). We passed Lemmer, Emmeloord before we reached the 200 K mark (second 100 K @ 33.4 km/h avg). Here we needed some navigation as none of us exactly knew how to go from here on out but we should have relied on the road signs (they are very good in The Netherlands, especially for bicycling) instead of the route on my Garmin Edge 810. Via detour we did end up on the right road to Kampen. In Kampen we refuelled again at a gasstation. Getting crisps to replenish the salt and of course water! From here we headed S/SW towards Harderwijk, somewhere between Kampen and Harderwijk my 810 battery died (9 hours and 54 minutes). Mostly due to using navigation. As Pirmin's 810 held out the entire route. Even my trusty Forerunner 305 didn't do much better but then it's getting on in age. However the kilometres really started to get to us on the way to Harderwijk, not so much for Stephan, he just kept on going. Even though we all had plenty of time up front he just did more. As a group we were very solid indeed for people who just met that morning. Around Nijkerk (300+ K mark, third 100 K avg 32.4 km/h) on the Zeedijk we really got some headwind to deal with (also why we didn't opt for going via Lelystad/Almere). The scenery was beautiful though as the sun was slowly setting, however we still had some daylight left. A little further on the Zeedijk we did get some showers but this was more then welcome to cool us off and only lasted a few minutes. Bunschoten marked the first part where my saddle soreness was getting to the point that I couldn't sit down for long periods of time and had to get out of the saddle for a bit and sit back down. The last 60 kilometers or so were the hardest of the entire day, of my life. Off all the sports I have done cycling is probably one that I have hit more physical barriers and kept going then any other. Suffering and cycling goes hand in hand. A few month before I did a tour that involved climbing on the bike. My first real experience with climbing. From 8% over 4+ kilometres to a few kilometres at 20 %. Both made me face myself and I was amazed how much one can suffer. The body can only go so much but the mind...the mind can just keep going. I stand by these words "Shut Up Legs!!!". On this part of the trip however my energy levels were depleted, my strength had long gone and I couldn't refuel. My body just didn't want anything to do with sugar anymore. It wanted real wholesome food. But I had none to give it. So only thing I could do is fuel with liquid that it couldn't object to too much. It was water and energy drink and nothing else during the last 60 kilometres. The last 60 kilometres was cycling on pure character and with support from the group. We were nearing the end of our long day. Almost there...almost. We crossed this intersection, that roundabout, this bridge and that one. On the final bridge Stephan showed he had plenty of energy left. He went for it, he crossed the bridge like it was nothing and broke his PR on it. The rest of us were kaput but pushed ourselves over the bridge and to the beginning or rather finish. We made it....we were back where we started that morning. We did it...we circled the IJsselmeer. My longest ride to date and it will be for quite a while. We congratulated each other and said our goodbyes. Pirmin and I cycled back to the ferry we had taken more then 14 hours ago and took the train bound for Rotterdam. I never touched the saddle on the ride back, or even the two days after that epic day. Elapse time 14 hours, 32 minutes, 34 seconds. 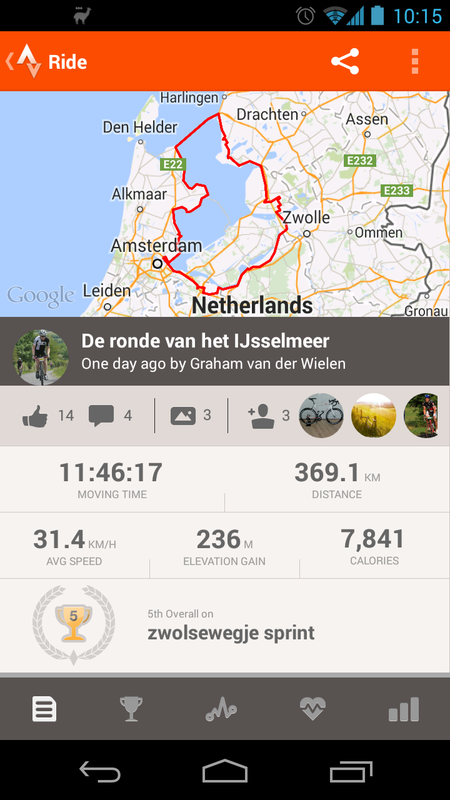 369 kilometers @ 31,4 km/h average.